Thank you -- the community -- for making this such a successful program. EDITOR NOTE: Bert Heeren was the chair, Kenneth & Helen Gudehus were treasurers and Rev. Shellaway spearheaded this project and really did a lot of the behind the scenes work to make this program a big success! NOTE: Any community group is welcome to adapt our successful program for use in their fund-raising effort. Please contact Chairman Bert Heeren, 248 Hamilton Avenue, Hasbrouck Heights, NJ 07604 for details. Presentation of second camera by the committee to the HHFD during January Mayor & Council meeting. Copy of the appeal that was delivered to everyone in the community. You can give our brave Hasbrouck Heights Firefighters a tool to see through dense smoke and darkness -- and Save Lives! "In an instant, your home is filled with smoke. Your alarm sounds and you rush to leave. Within moments you become disoriented. You struggle to breathe, but are overcome by dense smoke. You collapse in the darkness -- realizing that if you are not rescued quickly, you will die. Panic strikes you before becoming unconscious -- How can they find me in this dark, thick smoke?" Here's where a Thermal Imaging System can save your life. Or save the lives of your family. Or save the lives of your friends, neighbors, employees or business associates. Here's how Thermal Imaging will help Firefighters do this job. Smoke and darkness no longer inhibit the firefighter from seeing the thermal image of the fire and its potential victims. Search and rescue time is dramatically reduced with enhanced vision to see through dense smoke ... see body heat from victims .. see heat behind walls, floors and ceilings. Rescue workers can move swiftly in unfamiliar surroundings. With a Thermal Imaging System, firefighters can look at the structure for the best point of entry. Ventilation is quicker and more accurate ... heat and hot gases are released when and where ventilation is needed most. Signs of potential flashover, once hidden by thick smoke are more visible. Floors that have been dangerously weakened from fire below can be avoided. The seat of the fire can be located faster, reducing unnecessary fire, water and structural damage. HAZMAT operations are enhanced ( ... able see the vapor clouds from spills). When appropriate, this technology will be used by the HHPD. 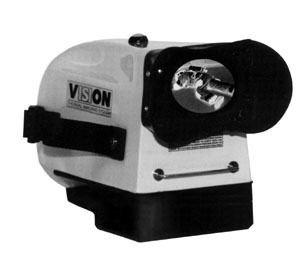 The citizens of Hasbrouck Heights are collecting money to purchase a Thermal Imaging System for our Fire Department. Your generosity will Save Lives! Your company can make a difference. Your company can help save lives right now. Please join with the business community of Hasbrouck Heights in making this life saving contribution. 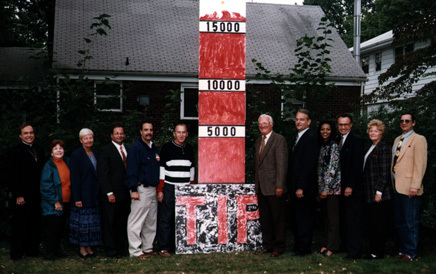 Please send your tax deductible contribution to: T.I.P., 248 Hamilton Avenue. Hasbrouck Heights, NJ. 07604. PS: Your generous contribution will be greatly appreciated by the community where you work. 100% of your tax deductible investment will go toward acquiring this technology for Hasbrouck Heights. On behalf of the people whose lives you are saving --- Thank You! From Left to right: Dwight D. Shellaway, Helen Gudehus, Margaret W. Heeren, William J. Torre, Anthony Greco, Kenneth C. Gudehus, Herbert D. Heeren, Bruce W. Werner, Shelley Claude, Ralph W. Chandless, Jr., Ursula Steinhauff, Fritz Rethage. Absent from photo: Ethel Ball, Jack Ball, Byron DeRussy and Andrew Link III.